Brushless DC (BLDC) motors are one of the most widely used motors, not only because of their efficiency, and torque characteristics, but also because they have the advantages of being a direct current (DC) supplied, eliminating the disadvantages of using Brushes. BLDC motors have a very wide range of speed, so speed control is a very important issue for it. Sliding mode control (SMC) is one of the popular strategies to deal with uncertain control systems. The Fuzzy Sliding Mode Controller (FSMC) combines the intelligence of a fuzzy inference system with the sliding mode controller. In this paper, an intelligent Fuzzy Sliding Mode controller for the speed control of BLDC motor is proposed. The mathematical model of the BLDC motor is developed and it is used to examine the performance of this controller. Conventionally PI controllers are used for the speed control of the BLDC motor. When Fuzzy SMC is used for the speed control of BLDC motor, the peak overshoot is completely eliminated which is 3% with PI controller. Also the rise time is reduced from 23 ms to 4 ms and the settling time is reduced from 46 ms to 4 ms by applying FMSMC. This paper emphasizes on the effectiveness of speed control of BLDC motor with Fuzzy Sliding Mode Controller and its merit over conventional PI controller. Fig 1 Block diagram of BLDC speed control. 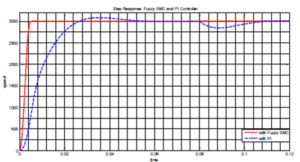 Fuzzy sliding mode controller for the speed control of BLDC motor is designed and its performance comparison with PI controller is carried out in this paper. Conventionally PI controllers are used for the speed control of BLDC motor and they give moderate performance under undisturbed conditions even though they are very simple to design and easy to implement. But their performance is poor under disturbed condition like sudden changes in reference speed and sudden change in load. The BLDC motor with PI controller shows large overshoot, high settling time and comparatively large speed variation under loaded condition. The Fuzzy Sliding Mode Controller combines the intelligence of fuzzy logic with the Sliding Mode technique. The peak overshoot is completely eliminated and the rise time and settling time are improved when Fuzzy SMC is applied for the speed control of BLDC motor. The fluctuation in speed of the motor under loaded condition is also reduced when fuzzy SMC is applied. Thus this controller becomes an ideal choice for applications where very precise and fine control is required. Neethu U., Jisha V. R., “Speed Control of Brushless DC Motor : A Comparative Study”, IEEE International Conference on Power Electronics, Drives and Energy Systems, Vol. 8, No. 12, 16-19 December 2012, Bengaluru India. Chee W. Lu, “T orque Controller for Brushless DC Motors”, IEEE Transactions on Industrial Electronics, Vol. 46, No. 2, April 1999. Tony Mathew, Caroline Ann Sam, ”Closed Loop Control of BLDC Motor Using a Fuzzy Logic Controller and Single Current Sensor”, International Conference on Advanced Computing and Communication Systems (ICACCS), Vol. 2, No. 13, 19-21 December 2013, Coimbatore India. 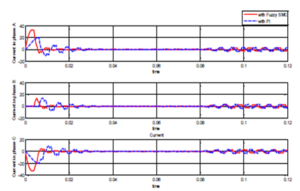 T . Raghu, S. Chandra Sekhar, J. Srinivas Rao,“SEPIC Converter based – Drive for Unipolar BLDC Motor”, International Journal of Electrical and Computer Engineering (IJECE), Vol.2, No.2, April 2012, pp. 159- 165. M. A. Jabbar, Hla Nu Phyu, Zhejie Liu, Chao Bi, “Modelling and Numerical Simulation of a Brushless Permanent – Magnet DC Motor in Dynamic Conditions by Time – Stepping T echnique”, IEEE Transactions on Industry Applications, Vol. 40, no. 3, MAY/JUNE 2004.